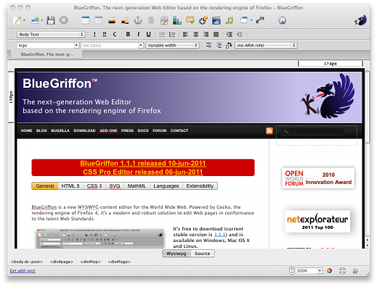 BlueGriffon WYSIWYG content editor for the World Wide Web, added to Graphic directory. Because Gecko lives inside BlueGriffon, the document you edit will look exactly the same in Firefox 4. Advanced users can always use the Source View to hard-code their page. BlueGriffon is available in English (en-US), French (fr-FR), Portuguese (pt-PT) and Simplified Chinese (zh-CN).